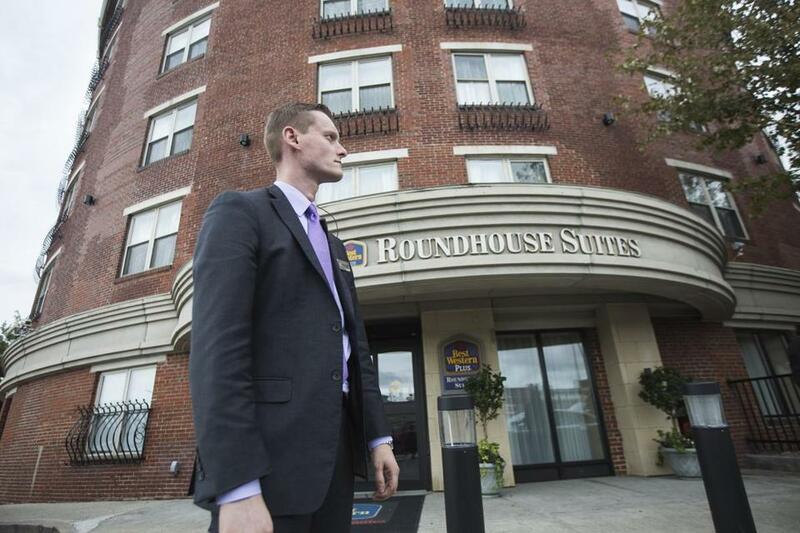 The Best Western on Massachusetts Avenue recently hired security guards after guests reported being harassed. 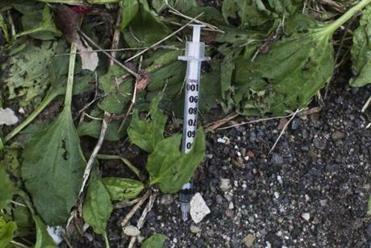 An influx of services for the homeless in Boston’s Newmarket area has been accompanied by a sharp increase in some crimes and has raised concerns about knots of men and women who loiter, take drugs openly, and discard needles throughout the area. The Best Western on Massachusetts Avenue recently hired security guards to patrol its property all day, after guests reported being harassed. Online reviews of the hotel have turned increasingly negative, warning potential guests to avoid the area. In a preliminary report provided to the Globe, police found that violent crimes in Newmarket rose 30 percent in the first nine months of this year compared with the same period last year. 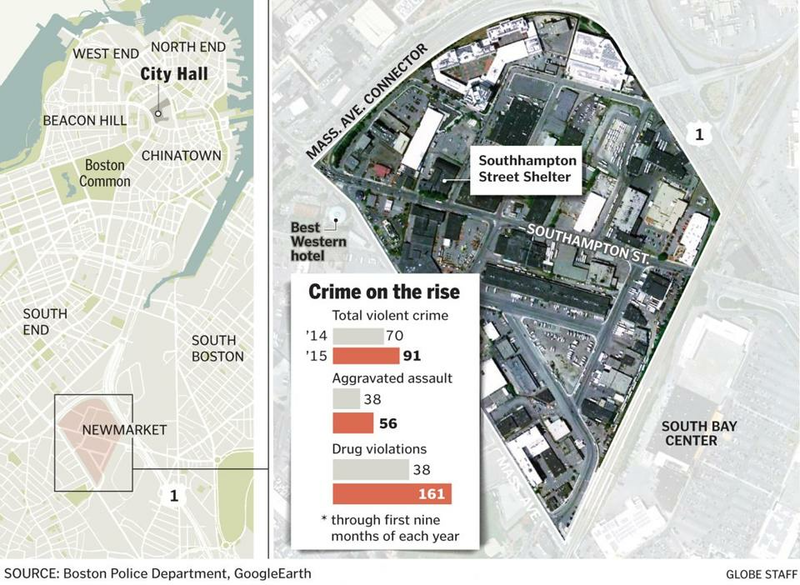 Drug violations in the area jumped 55 percent, and aggravated assaults rose 47 percent, though property crimes dropped 17 percent, police said. The rise in crime has come as 400 homeless men have moved into a new $10 million shelter in a renovated transportation building in the area. City officials moved the men there after they condemned an old bridge leading to Long Island. That decision, a year ago this week, shuttered the refuge on Boston Harbor. The city is ramping up efforts to help as the problem has become more prevalent in upscale and touristy neighborhoods. Police noted that the rise in violent crime in the area contrasts with a citywide 3 percent decline in similar crimes during the same time. Police said they are paying close attention to Newmarket and have added a new squad of officers to patrol the area on bicycle. Yamileth Pagan, a cashier who has worked for three years at the New Market Pizza & Grill, said the change in the neighborhood has been dramatic. She said she frequently sees junkies pass out in the area and calls for an ambulance nearly every day. Over the past year, the area has become a hub of the city’s social services for addicts and the homeless. In addition to the new shelter on Southampton Street, the city has opened new methadone clinics in the neighborhood and is renovating the Woods-Mullen Shelter to host 200 women. 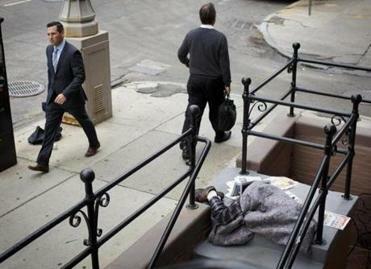 Several years ago, the Boston Health Care for the Homeless Program moved into the old city morgue a few blocks away. “I definitely don’t feel safe here,” said Yamileth Pagan. Public health officials say they have attended neighborhood meetings about the concerns and have been trying to respond. They say Boston Public Health police routinely patrol the area and try to reduce loitering. They have also moved the shelter’s entrance to a side street, installed needle collection boxes, and have teams that regularly comb the area around the shelter for sharps. 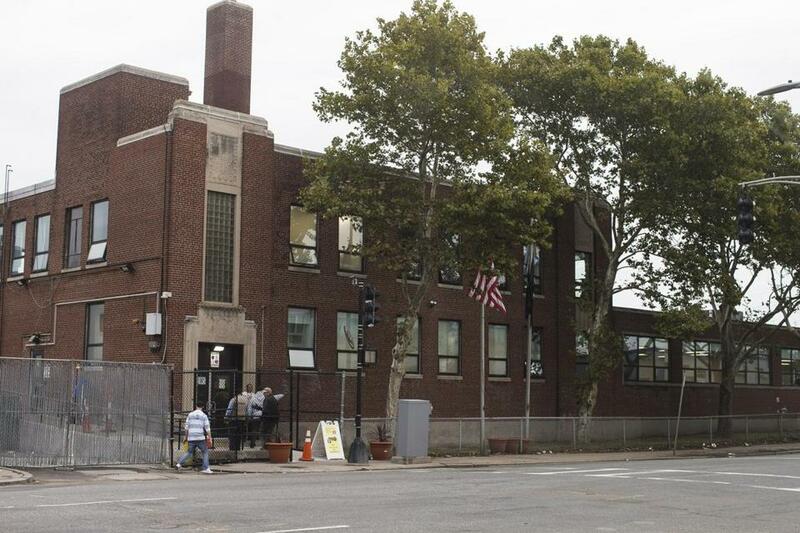 “[The city] is committed to maintaining a level of safety and comfort both inside and in the surrounding neighborhood,” said Che Knight, a spokeswoman for the Boston Public Health Commission, which operates the shelter on a budget of more than $675,000 a month. Homelessness in Boston increased more than 15 percent between late 2011 and early 2015, and the city has responded to concerns among residents and business owners in the Back Bay and downtown areas by forming a task force made up of social service providers, police, and the business community. The concerns about the homeless in Newmarket aren’t surprising to city officials, who struggled to find a home for the new shelter and faced protests when they proposed moving services for the homeless to other neighborhoods. The appeal of Newmarket was that there are few homes, and the neighbors include gas stations and storage facilities. But not even this rough-hewn neighborhood of crumbling concrete and old warehouses has been able to ignore the changes brought by nearly 400 homeless men moving in. City Councilor Ayanna Pressley, who chairs a committee that has held hearings on the consequences of the city’s closing of Long Island’s shelter, said she appreciates neighbors’ concerns. “This is what everyone feared,” she said, noting how residents protested when city officials had proposed moving some of the island’s services to Roxbury. She said she hopes the city will do more to look after the people who live and work in Newmarket, as well as the homeless who stay in the nearby shelter. A needle littered the ground outside the shelter. The increased patrols in the neighborhood haven’t been enough to keep Hamid Barakat from finding groups of homeless men camping out in the parking lot of his auto body shop on Massachusetts Avenue, leaving mangy blankets, refuse, and human waste. At Table Toppers, which sells wedding supplies in a building next door to the new shelter, the staff recently moved security cameras so they can monitor what’s happening on the sidewalk along Southampton Street.